Status: Operational 2013. First Launch: 2013-12-26. Last Launch: 2014-10-21. Number: 2 . AM-5 used a Reshetnev Ekspress-2000 bus with C, Ku, Ka and L-band communications payloads developed in collaboration with the Canadian company MDA. The Briz-M made four burns to deliver Ekspress AM-5 to a sub-geostationary orbit of around 33,800 x 37,800 km x 0.18 deg. It used its on-board electric propulsion system (ion drive) to complete the trek to GEO. 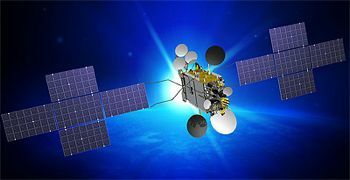 Ekspress-AM 5 Communication satellite built by ISS Reshetnev (ex NPO Prikladnoi Mekhaniki, NPO PM) (Bus), MacDonald, Dettwiler and Associates Ltd. (MDA) (Payload) for RSCC (Kosmicheskiya Svyaz), Russia. Launched 2013. Used the Ekspress-2000. Launched 2013. Yamal 401-2 Communication satellite built by ISS Reshetnev (prime); Thales Alenia Space (payload) for Gazprom Space Systems, Russia. Launched 2014. Used the Ekspress-2000A bus. Yamal 601-2 Communication satellite built by ISS Reshetnev (prime); Thales Alenia Space (payload) for Gazprom Space Systems. Used the Ekspress-2000 bus. Family: Communications. Launch Vehicles: Proton, Proton-M/Briz-M. Launch Sites: Baikonur LC81/24. Bibliography: 12311, 12312. 2013 December 26 - . 10:49 GMT - . Launch Site: Baikonur. Launch Complex: Baikonur LC81/24. LV Family: Proton. Launch Vehicle: Proton-M/Briz-M.
Ekspress AM-5 - . Mass: 3,600 kg (7,900 lb). Nation: Russia. Class: Communications. Type: Communications satellite. Spacecraft: Ekspress-2000. USAF Sat Cat: 39487 . COSPAR: 2013-077A. Apogee: 35,787 km (22,236 mi). Perigee: 35,786 km (22,236 mi). Inclination: 0.0400 deg. Period: 1,436.09 min. 2014 October 21 - . 15:09 GMT - . Launch Site: Baikonur. Launch Complex: Baikonur LC81/24. LV Family: Proton. Launch Vehicle: Proton-M/Briz-M.
Ekspress AM-6 - . Payload: EXPRESS AM-6. Mass: 3,358 kg (7,403 lb). Nation: Russia. Class: Communications. Type: Communications satellite. Spacecraft: Ekspress-2000. USAF Sat Cat: 40277 . COSPAR: 2014-064A. Apogee: 35,789 km (22,238 mi). Perigee: 35,783 km (22,234 mi). Inclination: 0.0200 deg. Period: 1,436.08 min. The final Briz-M burn was incomplete, leaving the communications satellite in an orbit with a 1373 min period - significantly below the planned orbit. Ekspress AM-6 had to reach its geosynchronous destination using extra xenon propellant from its own electric propulsion system at the cost of operational lifetime. Ekspress AM-6 orbit is 1373.2 min, 31307 x 37784 km x 0.7 deg; the Briz-M's auxiliary SOZ thrusters disposed of the stage into a 1512.4 min, 34984 x 39549 km x 1.0 deg orbit. Stationed in geosynchronous orbit at 140 deg east. 2017 August 16 - . 22:06 GMT - . Launch Site: Baikonur. Launch Complex: Baikonur LC81/24. LV Family: Proton. Launch Vehicle: Proton-M/Briz-M.
Cosmos 2520 - . Payload: Blagovest No. 11L. Nation: Russia. Spacecraft: Ekspress-2000. USAF Sat Cat: 42907 . COSPAR: 2017-046A. Apogee: 35,793 km (22,240 mi). Perigee: 35,778 km (22,231 mi). Inclination: 0.0300 deg. Period: 1,436.04 min. See Kosmos 2520 (Blagovest 11L). ..
2018 April 18 - . 22:11 GMT - . Launch Site: Baikonur. Launch Complex: Baikonur LC81/24. LV Family: Proton. Launch Vehicle: Proton-M/Briz-M.
Cosmos 2526 - . Payload: Blagovest No. 12L. Nation: Russia. Spacecraft: Ekspress-2000. USAF Sat Cat: 43432 . COSPAR: 2018-037A. Apogee: 35,791 km (22,239 mi). Perigee: 35,781 km (22,233 mi). Inclination: 0.0300 deg. Period: 1,436.06 min. See Kosmos 2526 (Blagovest 12L). ..
2018 December 21 - . 00:19 GMT - . Launch Site: Baikonur. Launch Complex: Baikonur LC200/39. LV Family: Proton. Launch Vehicle: Proton-M/Briz-M.
Cosmos 2533 - . Nation: Russia. Type: Comms 1. Spacecraft: Ekspress-2000. USAF Sat Cat: 43867 . COSPAR: 2018-107A. Apogee: 35,792 km (22,240 mi). Perigee: 35,781 km (22,233 mi). Inclination: 0.0800 deg. Period: 1,436.10 min. See Kosmos 2533 (Blagovest 13L). Blagovest military communications satellite. Some reports suggested a problem with the final Briz-M burn, but on December 29 it was shown by US tracking in a 35421 x 35802 km x 0.2 deg orbit drifting over 77E.